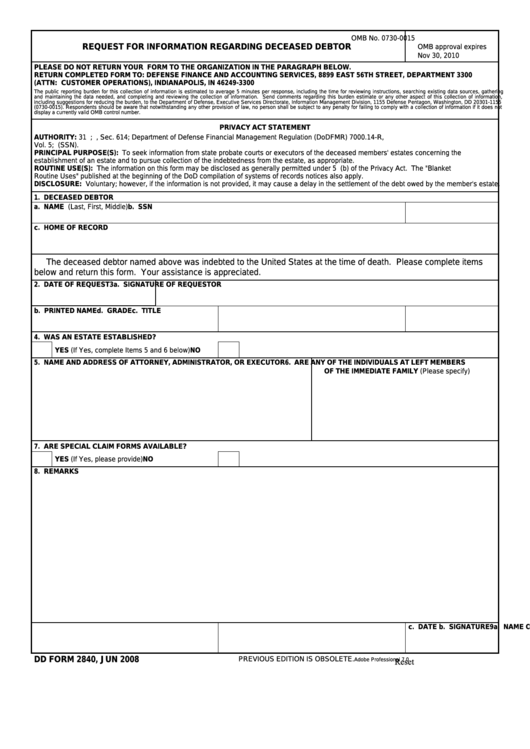 Download a blank fillable Dd Form 2840 - Request For Information Regarding Deceased Debtor in PDF format just by clicking the "DOWNLOAD PDF" button. Complete Dd Form 2840 - Request For Information Regarding Deceased Debtor with your personal data - all interactive fields are highlighted in places where you should type, access drop-down lists or select multiple-choice options. PLEASE DO NOT RETURN YOUR FORM TO THE ORGANIZATION IN THE PARAGRAPH BELOW. display a currently valid OMB control number. Vol. 5; E.O. 9397 (SSN). establishment of an estate and to pursue collection of the indebtedness from the estate, as appropriate. Routine Uses" published at the beginning of the DoD compilation of systems of records notices also apply. DISCLOSURE: Voluntary; however, if the information is not provided, it may cause a delay in the settlement of the debt owed by the member's estate. below and return this form. Your assistance is appreciated. 4. WAS AN ESTATE ESTABLISHED? 7. ARE SPECIAL CLAIM FORMS AVAILABLE?